The cast of Modern Warfare 3 apparently has a lot to say. 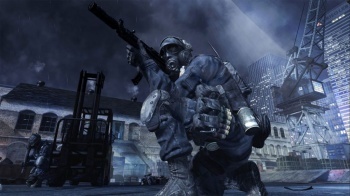 Call of Duty: Modern Warfare 3 will have more lines of dialogue than a 102 half-hour TV shows. That's according to Activision's Keith Arem, who says that the game has around 41,000 lines from dozens of different characters. "To give everyone a kind of perspective," Arem said, "if you look at an average television show, a half-hour series, that has about 400 lines of dialogue, and a full motion picture is going to have around 1,500 lines of dialogue." He said that the lines piled up pretty quickly when you had upwards of 80 characters and soldiers on top of that, and MW3 was significantly more verbose than its predecessor, Black Ops, to the tune of around 10,000 lines. It took a whole year to record that much content he said, both in recording booths and motion capture studios. While 41,000 is a very big - and admittedly impressive - number, when it comes to dialogue, quality trumps quantity hands down. There's going to be an awful lot of talking in Modern Warfare 3 and it will be interesting to find out how much of it is worth listening to.